The Sacred Heart Pioneers women’s basketball team began NEC play this year at 6-0, one of their best starts in quite some time. One could make a case that the Pioneers are actually just picking up right where they left off last year. Last season, the Pioneers brought six freshmen into the mix, and went through some early growing pains, getting off to a 3-8 start. 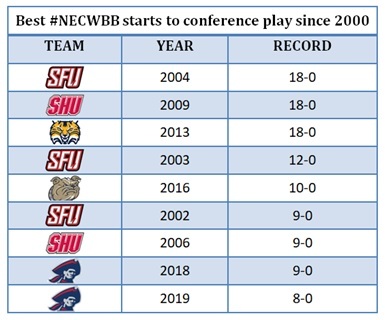 However, after the first week in February, things clicked into high gear and Sacred Heart went on an incredible surge, winning six out of their final seven regular season games and advancing to at least the NEC Tournament semi-final round for the third straight season, and for the fifth time in the last seven years. As far as the experience factor is concerned, things have completely turned around. The Pioneers now boast one of the most experienced lineups in the NEC, with no freshmen, two seniors, and three grad students on their roster. In the Northeast Conference, there are currently six women’s basketball student-athletes listed as graduate students. As mentioned, Sacred Heart features three out of those six, with Katherine Haines, Erin Storck, and Kiana Ye all having walked last spring and currently in the midst of their graduate school programs. CD: What was the workload like over the years, taking on extra credits in addition to basketball and other responsibilities? What was it like having to manage all of that? ES: We’re lucky that we get to take classes over the summer. So even incoming as a freshman, you get credits that transfer in from high school, but then we have those summer classes that we are mandated to take in the beginning, help push us along and get us ahead of the game. For me personally, it got me adjusted to the college life very quickly, which was nice. As a freshman you have to deal with the beginning of classes, basketball, all of that. It was nice to have basketball kind of under your belt a little bit and classes under your belt. KY: I completely agree. The pace and everything coming in over the summer, it’s like a job. You have basketball and then you have online classes or in class for three hours a day, so it’s not bad. It benefits us in the long run. ES: And the good benefit of academics and athletics is that we were able to build good relationships with our professors. I really feel like the professor relationships helped me. I was able to go to their office hours and get a better connection with them. Being a basketball player, several of our professors, like Professor Scarpati, always comes to our basketball games, and that kind of support is amazing. They understand the workload, but they also hold us to a high expectation. CD: Do you think it is any benefit that you already completed graduation and are already in the graduate program, that those pressures are already behind you during this basketball season? ES: The only sacrifice is that because of our time commitment, other people are able to get more internships and job experience at this point. We both have internships and jobs during our offseason, but that time commitment cuts us a little short. KY: The journey leading up to grad school was long, but honestly it was amazing. Getting your masters paid for and getting it in five years is awesome to put on your resume, and the employers get to see that. I think everything will be worth it, and seem worth it, when I clinch my first job. So that’s been a little pressure lately, but honestly, we’re set up for success at Sacred Heart. CD: What kind of internship experiences have you had? KY: This past summer I worked with a graphic design internship in NYC, with the fashion industry. That’s where I’m heading for too, so it was a good experience. ES: Mine was at home, it was a marketing company. It was cool because they worked a lot with packaged goods, displays, and a lot of it was in the cosmetic industry. For me it was exposure to a side of the industry that I didn’t even know existed. That kind of opened my eyes that there is a lot of opportunity out there that I didn’t even know exists. CD: Switching gears to basketball, what has been the key to the team’s great start this year? KY: We’re having fun. First game we won, second game, and now it’s a six game, and we’re like, ‘wow this is a lot of fun.’ And we’re really hungry. Especially being here for five years, being so close. But now we just want the ring. We want the banners, we want the ring, and with this group of girls, makes it real special. CD: It does seem like you guys are having fun and there’s this special vibe with your team. Are you sensing that too? ES: Absolutely. Obviously, we have our long-term goals that we’re all committed to. Coach has made an emphasis on the day to day, getting better every day, and a big emphasis is on being good teammates. When we are good teammates to each other, that is when we have so much fun with each other. That’s extra high fives, extra celebrations, our games are just more exciting to play when we are playing for each other. CD: A few years back, you had the NEC championship game was right here at the Pitt Center. How much of that experience do you think about, especially now that it’s your last go around, to try and get back to that point and have a different outcome? KY: I think about it every day. And it’s good that we experienced it, because now the younger girls, they see that we’ve been there and all the experiences that we’ve been through. CD: What were some of your memories of going to Argentina with the team over the summer? ES: The experience was unbelievable. Never in my life did I think that would be an opportunity. Then to share it with the people that I shared it with, with this team and the coaches, was unbelievable. Then having the basketball exposure, that was just an added benefit. We were able to play their national team, and all of it was kind of surreal, but I was happy we were able to do it with the people we did it with, because that made it so special. KY: That’s the thing, basketball takes you to places that you would never expect. Argentina, the culture, and the people, and the food, it was all a great experience. And getting in the gym early gave us an advantage, we got to work together, play against national teams, so it was a great experience. CD: Have you ever seen Kat (Haines) play as well as she has been playing over the last few weeks? KY: I think it goes back to the hungry part. Even in the summer, we had internships in the city every day, so we took the train at 6am every day, and we had talks about ‘what do you want for the season?’ She’s hungry, she was hungry since the summer. That’s the attitude that’s not new for Kat, she’s always been so competitive, but this has been a whole new level. CD: How do you plan on leaving the place better than how you found it, when your playing career with SHU is done after this year? ES: A big thing the both of us have emphasized is the importance of team chemistry. Kiana specifically led the way with that, not just on the court but off the court. When we had six freshmen last year, she made sure to take them under her wing. I feel like leaving that mark will be important moving forward. The season is so long, we have to be a family in order to succeed. I know the girls under us will do the same thing moving forward because of the impact that we’ve had on them, and they will want to continue that. KY: This year five seniors are leaving, and then we’ll have a whole new round of girls coming in. So we’re hoping, exactly what Erin said, that they are going to take them under their wing, spread the culture, and be like ‘we’re a family and we love each other.’ When Adaysha Williams, Hannah Kimmel, and Kelcey Castro were here they did the same for us, so that’s the culture and the history that Sacred Heart basketball brings. CD: Looking forward, where do you see yourself in 4-5 years? KY: Great question, I’ve been asking myself that every day. I’ve been applying to jobs every day. Right now, my goal is to get into the fashion industry and see where that brings me. I’m very ambitious and flexible, that’s what basketball taught me, so we’ll see. CD: Finally, what does the team need to do or continue to do in order to win that championship this year? ES: Stay focused on our strengths, on staying together, playing for each other, and being good teammates. The season is long and we’re expecting highs and lows. We just want to make sure that, at least if we can stay consistent on the things we can control, that will give us the best outcome. KY: Stay confident, stay having fun, and look at it day by day. Long term goals are awesome, but we have to work hard 100% of the time and we can’t take a play off, because that play we take off, someone is going to punch us in the throat, so we just got to keep working. Coming off of a tough Pennsylvania road trip, the Pioneers will return home for the start of a three game homestand on Saturday, February 2nd, when they host the St. Francis Brooklyn Terriers. *WHERE THEY STAND: For the second straight season the Robert Morris Colonials completed a perfect January and an 8-0 start in conference play, with victories this past weekend against Wagner (69-46) and Sacred Heart (64-46). The Colonials stand in sole possession of first place, two games clear of the Pioneers. In Monday night’s victory over Sacred Heart, the Colonials dominated down low from the get-go, outscoring the Pioneers in the paint 36-14. RMU’s duo of Nneka Ezeigbo and Ire Ozzy-Momodu combined for 30 points and 22 rebounds, while holding the reigning Player of the Week, Katherine Haines, to just seven points and four rebounds on the night. In conference play, RMU has allowed only 50.8 points per game, holding opponents to under 50 points four times. Their stingy defense has also held opponents to 33% shooting and has forced nearly 20 turnovers per game. Robert Morris, who hasn’t lost a game in January since 2017, will hit the road to begin the month of February with a one-game road trip in New Jersey. RMU will look to equal last year’s 9-0 league start on Saturday against Fairleigh Dickinson. With a win, the Colonials would be the ninth team since the turn of the century to start at least 9-0 in NEC play, but the first ever to do it in consecutive seasons. Meanwhile, following a pair of losses in Pennsylvania, the Sacred Heart Pioneers slip down to second in the standings, one game ahead of St. Francis Brooklyn and Saint Francis U. The Pioneers will look to rebound and keep control of the #2 spot when they host St. Francis Brooklyn on Saturday. The Pioneers and Terriers just met nearly two weeks ago in Brooklyn, as SHU squeaked out a two point win with a pair of defensive stops in the final seconds. 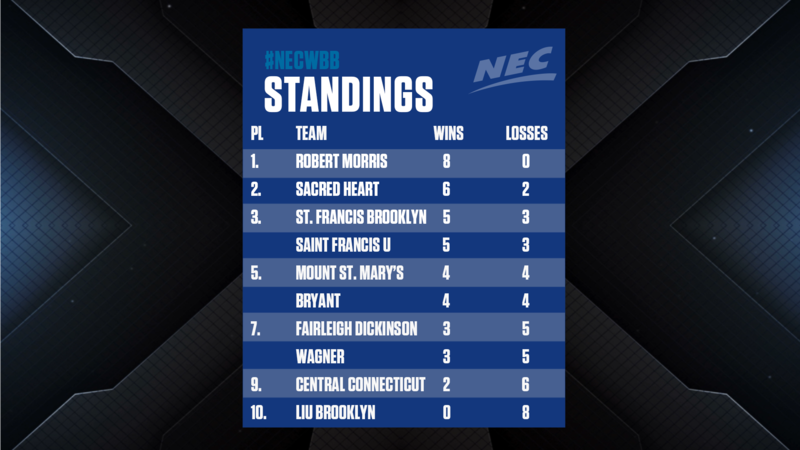 Mount St. Mary’s and Bryant are currently tied for fifth place, one game back of the Terriers and Red Flash, while Fairleigh Dickinson and Wagner are sitting tied for seventh place. Central Connecticut picked up a huge win on Monday night against LIU Brooklyn 63-57 to stay one game out of the top eight. *ANOTHER MOUNT MONDAY: Last week here in the NEC Overtime! Blog we brought up the interesting discrepancy between Mount’s numbers in conference games on Saturday compared to Monday. This week, the Mount kept that Monday momentum rolling with a thrilling 78-75 victory over St. Francis Brooklyn. The battle between two of the top shooting teams in the league was a back and forth tussle that saw nine ties, 13 lead changes, and the largest lead for either team stand at seven points. It would come down to the final eight seconds and a missed three by Amy O’Neill before the Mount could seal the win. Four Mountaineers finished in double figures scoring, with senior Juliette Lawless leading the way with a 28 point effort on 11-19 shooting and 4-6 from three. Both teams shot over 40% for the game. Mount had the advantage from behind the arc, netting 12 made threes, but the Terriers cashed in at the charity stripe, going 14-18. A key difference was the Mount committing only nine turnovers, while forcing 19 Terrier miscues, and turning them into 22 points. Unfortunately, next week’s schedule does not include a Monday game, so the Mountaineers will have to wait until February 11th to take the court again for another “Mount Monday” opportunity when they travel to LIU Brooklyn. *HITTING THE CENTURY MARK: For the fourth time this season, a Northeast Conference team reached triple digits on the scoreboard, as the Saint Francis Red Flash defeated the Wagner Seahawks 107-70 on Monday night. The 107 points marked the second highest scoring total in the league this season (behind St. Francis Brooklyn’s 110 points back on November 16th) and the fifth highest point total for a single game in Red Flash history. Among the impressive offensive numbers: SFU shot 60.9% from the floor, made a season high 18 three pointers on the night (second most for a single game in program history), and produced an incredible 31 assists on 39 made field goals (also second most for a single game in program history). *1,000 POINTS: Congratulations to the latest 1,000 point scorer in the Northeast Conference, St. Francis Brooklyn senior Maria Palarino. The Terrier senior became the 17th member of the St. Francis Brooklyn 1,000 point club, and the fourth NEC women’s basketball player to reach the 1,000 point mark this season. Palarino reached the milestone on a layup late in the second quarter of Monday night’s game at Mount St. Mary’s. Looking ahead, there are four other NEC women’s basketball players on track to possibly reach 1,000 points by the end of the season, including: SFBK’s Jade Johnson (81 points away), FDU’s Madelynn Comly (114 points away), Mount’s Juliette Lawless (170 points away), and SHU’s Erin Storck (193 points away). The NEC women’s basketball conference schedule enters February and hits the halfway point with a single game weekend. In a one week only break from the usual Saturday-Monday routine, teams will play on Saturday afternoon and then have a full week before they return to action again on Saturday, February 9th. This week’s feature game will be our ESPN3 “Game of the Week” with the reigning champion, Saint Francis Red Flash visiting Emmitsburg, MD to take on the Mount St. Mary’s Mountaineers with Paul Dottino and Joe DeSantis on the call. The Red Flash and Mountaineers will both come in with a ton of momentum. After starting 3-0 and then dropping three straight, SFU rebounded with a strong sweep this past weekend of Sacred Heart and Wagner. Saint Francis averaged 96 points on 55% shooting in the two games, while only allowing an average of 69 points. On the other side, after starting NEC play 0-3, and 1-4 in their first five, the Mount have won three in a row and four out of their last five. Senior Juliette Lawless has averaged 22.7 points on 54.8% shooting during their current three game streak. Standing in the ESPN3 national broadcast spotlight will be the top two scorers in the NEC, SFU’s Jess Kovatch (21.5ppg) and Mount’s Juliette Lawless (18.7ppg). While these two top stars will certainly draw a ton of attention, there are several other notable standouts to pay close attention too. Mount freshman Michaela Harrison turned a lot of heads in non-conference play when she recorded a 30 point outing in just her fifth career contest back in November against Towson. While she struggled to maintain that level of play in the few games immediately thereafter, she has really turned it on as of late. Harrison made her way back into the starting lineup for the last four games, averaging 15ppg during that stretch. For SFU, Courtney Zezza is coming off perhaps her hottest shooting weekend of her career, connecting on eight threes over the two game span. Also, Red Flash sophomore Haley Thomas has been among the most improved players in the league this year. In conference play, the Hooversville, PA native is second on the team, averaging 12.3 points per game (up from averaging only 1.9ppg in NEC play last year). Thomas has also gone 39-40 on the season from the charity stripe, converting on 38 straight free throws since her last miss back in November against Seton Hill. In Saturday’s game, all eyes figure to be focused on the three point line, as Saint Francis U and Mount St. Mary’s are the top two teams in three pointers made and three pointers attempted in conference play. These two teams already met back on the opening weekend of conference play in early January, with SFU coming away with a 68-66 victory at home. In that game, both teams combined for 54 three point attempts. In fact, 45% of all shots taken in that game came from three-point land. The game would feature plenty of drama, with five ties and 12 lead changes. With the game tied at 63 and a minute and a half showing on the clock, SFU’s Karson Swogger drained a three, followed by a pair of Kovatch free throws to put the Flash up five. Harrison answered with a three with 38 seconds to spare, to cut the deficit to two. Swogger appeared to make the game clinching three with six seconds to go, however after a video replay, a shot clock violation was called instead. Mount would receive one final opportunity, however Daly Sullivan’s three point attempt from the corner would fall short, as the Red Flash escaped with the win. Historically, SFU has won three straight meetings and seven out of their last eight against the Mountaineers. This game will also include some very early postseason implications. The teams are only separated by one game in the standings, with the winner assured to finish the first half of conference play in the top four. A Red Flash win would also clinch the season series tiebreaker against Mount, which could come into play for seeding purposes and home court advantage, when we reach the conclusion of the regular season. THREE: Courtney Zezza, SR (SFU): Zezza put together her most impressive weekend of the conference season, scoring 17 points on Saturday against Sacred Heart and 15 points on Monday against Wagner. Zezza shot 55% for the weekend, including a blistering 47% from beyond the arc. The Plum, PA native, recorded a career high five threes against the Pioneers, including three straight makes in the final minute of the third quarter. TWO: Jess Kovatch, SR (SFU): The NEC’s all-time leading scorer recorded a combined 53 points on the weekend, while shooting a red hot 63%. Against the Pioneers, Kovatch scored 23 points on 7-11 shooting. Then on Monday night against Wagner, Kovatch recorded her second 30 point game of the season. In the first half against the Seahawks, she was nearly ‘can’t miss,’ with 18 points on 6-10 shooting and 4-7 from three. Overall, Kovatch would finish the night with 30 points on 10-16 shooting and 6-10 from downtown. Kovatch is a top 15 scorer in the country and stands third in the nation in three point field goals made per game. ONE: Nneka Ezeigbo, JR (RMU): On a weekend where the Robert Morris Colonials looked pretty dominant in the post during victories over Wagner and Sacred Heart, Nneka Ezeigbo earns our top “Star of the Week.” Ezeigbo posted a pair of double-doubles with 13 points and a season-high 17 rebounds against Wagner on Saturday, and then followed that up with 16 points and 11 rebounds in a battle for first place against Sacred Heart. Ezeigbo partnered with sophomore Ire Ozzy-Momodu to firmly control the paint against the Pioneers. The duo combined for 30 points and 22 rebounds on the night, and helped lead the Colonials to a 36-14 advantage in points in the paint. Since the start of conference play, Ezeigbo has been amongst the league’s best in rebounding, steals, and usage rate, while leading the league in offensive rebounds. *Saint Francis U senior guard Jess Kovatch has 2,588 career points, four points shy of surpassing Wagner’s Terrance Bailey (1983-87) for the most points scored in NEC men’s or women’s basketball history. Kovatch can become the leading scorer in all of Northeast Conference basketball on Saturday afternoon when the Red Flash visit Mount St. Mary’s on ESPN3. Thank you to Sacred Heart grad students Erin Storck and Kiana Ye for taking the time to sit down with us this week for our feature round table chat. Join us back here at the NEC Overtime! Blog next Wednesday, February 6th for a special edition of the NEC WBB Fast Break column. As teams hit the halfway point of the conference season following action on Saturday, we will roll out the red carpet and present the nominees for the Fast Break NEC Mid-Season Awards!